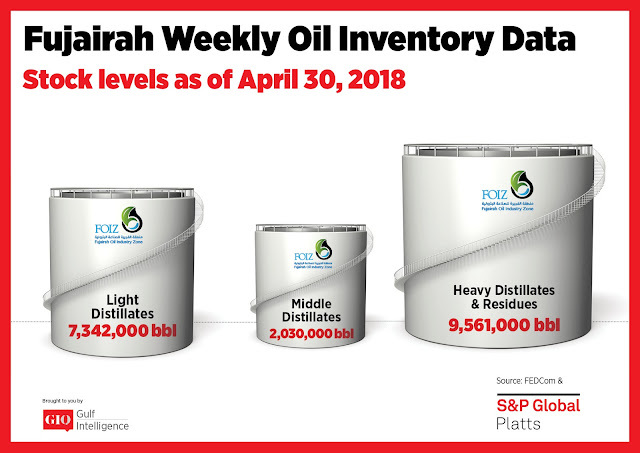 Total oil product stocks in Fujairah stood at 18.93 million barrels as of Monday, down 2.7% week on week, after hitting a seven-month high last week, according to data from the Fujairah Energy Data Committee, or FEDCom. The drop was mostly due to a sharp 10.7% fall in light distillate stocks, which include gasoline, slipping to 7.342 million barrels. 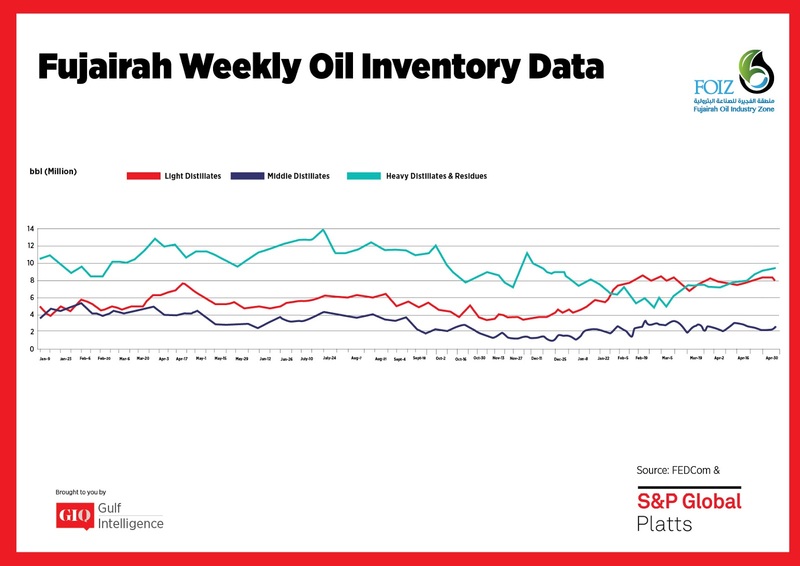 Premiums for Arab Gulf RON 95 gasoline edged up to a 15-week high of $2.90/b as regional demand builds leading up to the start of Ramadan in mid-May, though supply is still seen as largely balanced, S&P Global Platts Analytics said in a report Wednesday. Kuwait's KPC was reported seeking 25,000 mt of RON 91 gasoline via tender for delivery over May 18-19, having last week issued the same volume and grade for delivery earlier in the month. While light distillate inventories fell, stocks of the other product categories grew, with middle distillates up 16.1% week on week to 2.03 million barrels. Regional gasoil demand is also rising ahead of Ramadan, while additional support has come from tighter fundamentals in other regions. In Europe, lower stock levels and a strengthening market structure continues to pull in barrels from the East, Platts Analytics said. Stocks of gasoil in the ARA region are at a three-month low and about 30% lower year on year, according to data from PJK International. Asian supply is also relatively tight due to lower export volumes from China and India resulting from refinery maintenance and strong domestic demand, respectively. Stocks of heavy distillates and residues edged up 0.9% to 9.561 million barrels. Bunker demand in Fujairah was reported as healthy this week, although the volatility of crude prices continues to weigh on sentiment. "No one can predict the market these days due to geopolitical reasons," a Fujairah-based bunker trader said. Regional fuel oil demand is expected to pick up in the coming month as summer power demand comes in to play. Saudi Arabia is already increasing fuel oil imports to prepare for summer demand, according to one source.